We definitely have our go-to fish dishes, and it is easy to get stuck doing the same old thing with fish. 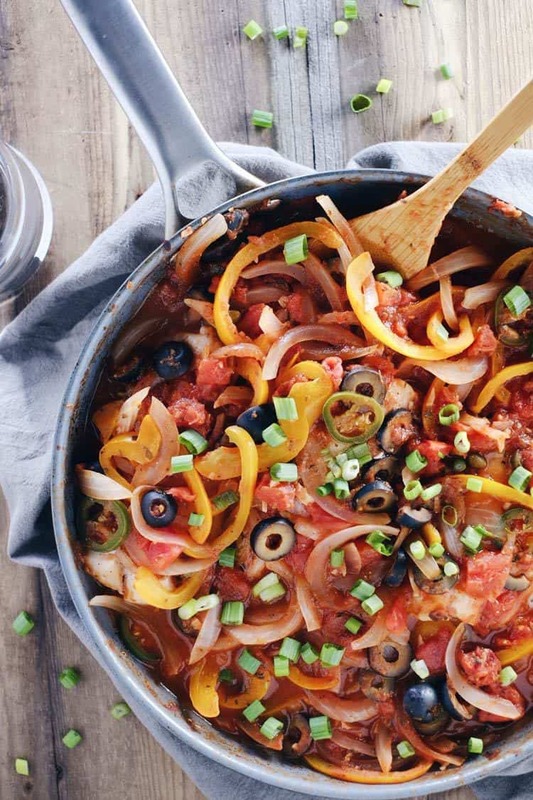 We love this veracruz style fish skillet because it is such a refreshing way to enjoy fish! It is bursting with flavors and you can make it more or less spicy to match your taste or mood. This unique sauce is traditionally a tomato based sauce with olives, jalapeños and capers. We added onions, bell peppers, garlic and oregano creating a delicious combination of flavors and textures. Then, pair this flavorful sauce with a flaky white fish, like cod or halibut. 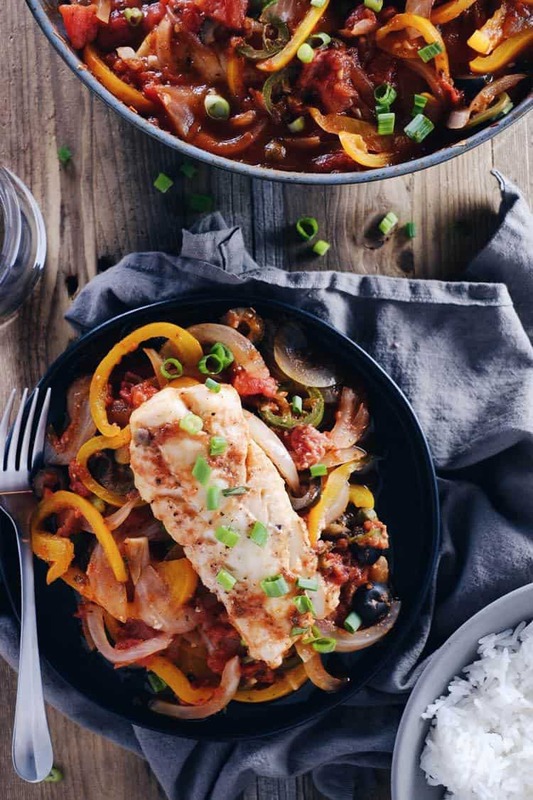 This veracruz style fish skillet is hearty enough to eat all on its own, or you can serve it with some plain white rice. Yes, we do eat white rice sometimes! You can read more about our take on white rice in a Paleo lifestyle at this post under the sub-heading “To White Rice Or Not?”. Go ahead and mix up your fish game, and try this veracruz style fish skillet. It is packed with flavor and easy to make! Let us know how it goes by leaving a comment below. Also, tag us on Instagram @realsimplegood, so we can check it out! 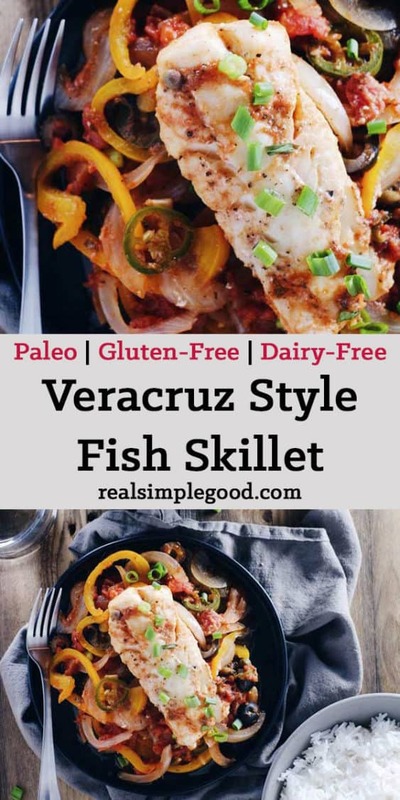 We love this veracruz style fish skillet because it is a refreshing Paleo + Whole30 way to enjoy fish! It's bursting with fresh veggies and flavors! Cut up bell pepper, onion, jalapeño, garlic and olives as noted. Place a large skillet over medium heat. 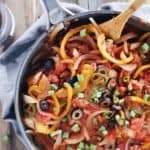 Add in bell pepper, onion, jalapeño, garlic, olives, tomatoes, marinara sauce, capers, oregano and a large pinch of salt and pepper. Stir and mix well. Cook, stirring occasionally, until the vegetables are tender and the sauce is starting to bubble, about 5 minutes. Season both sides of cod fillets with salt and pepper and place on top of the sauce. Spoon some of the sauce on top of the cod. Cover with a lid and continue to cook on the stove over medium heat for about 5–6 minutes, or until fish flakes easily with a fork. Serve fish with just the sauce topped with green onion or you can also serve over rice. Nutrition facts are an estimate provided for those following a Ketogenic or low-carb diet and do not include rice for this recipe. See our full nutrition information disclosure here.